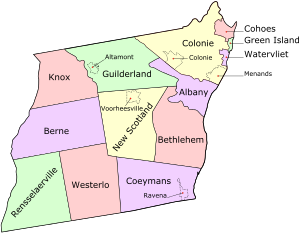 According to the New York State Department of Health, the pCI/L average in Albany county is 2.14 (last tested 2016). Out of a total of 2487 homes tested for radon in Albany County, 526 have failed radon tests with a 4.00 or higher using the EPA standards. As state and government entities raise awareness for health issues associated with Radon, mitigation systems are highly recommended for buildings over 4.0 PCI/L. Our testing devices measure the rate of radioactive decay, not mass or volume of radon. Many area’s in Albany County will test differently due to the various types of soil and bedrock. The only possible way to know if you have radon is to test for it as radon is inert and cannot be seen or smelled. Although radon can come from landfills and other man-made situations, the majority of radon comes from the soil beneath us. It is very localized, it comes from the area directly under and a few meters around buildings. If you are in need of a certified radon specialist near or within Albany county, contact us today for your radon requirements.